Front row (left to right): 1. unidentified, 2. Bryant Bennett, 3. Steve Rundstrom, 4. Tony Willour, 5. Donald Chase, 6. Mike Horton, 7. Andy Tullis, 8. Ted McIntosh, 9. Bill Nay, 10. Chuck Hartley. Second row: 1. Joy Gronemyer, 2. Becky Bone, 3. Sally Smith, 4. Mary Nevil, 5. Christine Peterson, 6. Leslie Hanson, 7. Carol Van Gundia, 8. Mary Battershill, 9. Sue Richardson, 10. Vicky DePreiste. Third row: 1. Rick Chesterman?, 2. unidentified, 3. Rick Spencer, 4. Charles Hennan, 5. Mr Lancaster, 6. Roger Good, 7. unidentified, 8. Larry Lundbom, 9. Mickey Evans. Credits: From the collection of Sally Smith. Thanks to Sally Smith, Karin McMahon Reitz, Carolyn (Clark) Montandon, and Suzie Ridgley for identifying the kids in the picture. 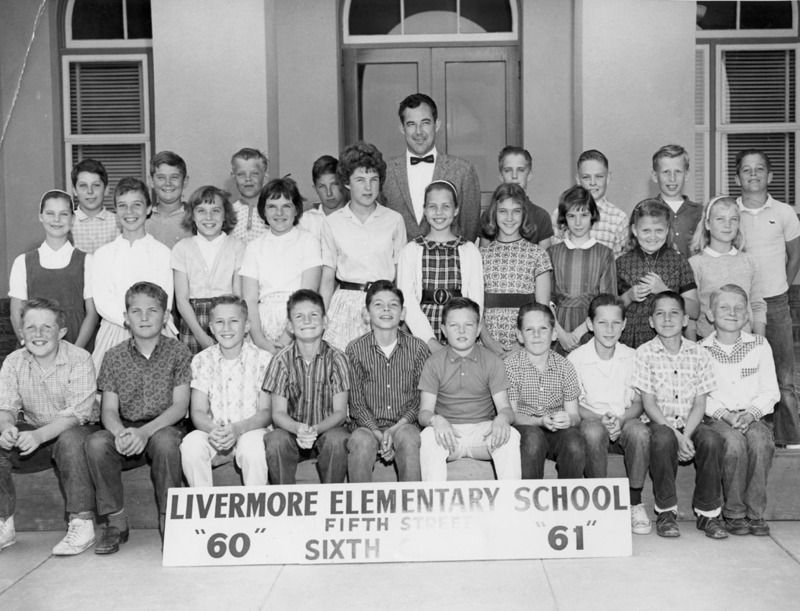 To find other pictures from Fifth Street School in the archive, see Livermore class pictures listed by school. And if you have any pictures from Fifth Street School that you would like to share, please submit them to the Archive.